Check the exam board for which you have been entered as most will give exemplar portfolio work as well as exam guidance. 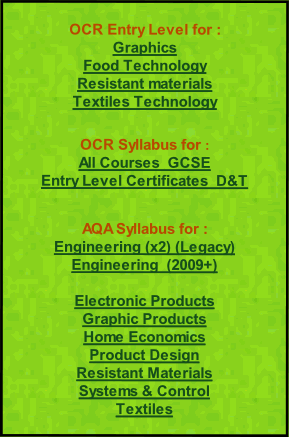 The revision section within this site may also help by giving alternative sources of information and pointers. Of course it is also useful to see the lists of topics you are expected to have covered and the syllabus will provide a really structured way for you to undertake assessment tasks and revision. If your teachers have already given you guidance then take their advice rather than plunging into the depths of the whole syllabus but for those parents, teachers and students who want the details then use the links supplied here. 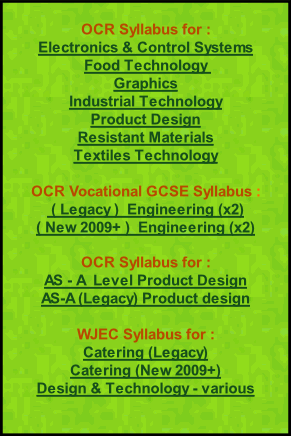 Exam boards are notorious for changing their sites and if any of these links doesn’t work – apart from letting ‘Design & Technology On The Web’ know by e-mail - then please type in the exam board name along with ’GCSE Design Technology’ and the subject title – and you should find the syllabus details easily for yourself. All permission from Copyright holders has been sought – If you find material to which you object in any way please contact the site and efforts will be made to remedy any situation. Any comments or contributions regarding this website ?